1. Wash the split peas and then place them in a bowl with water enough to cover the peas and 2 inches of the bowl above the peas. Cover and soak overnight. 2. Pour out the soaking water and rinse the peas in fresh water. 3. In a blender or food processor, grind the peas to a rough paste using enough water to keep it from clumping up like dough, then pour into a large bowl. 4. Mix the oats, carrots, salt and pepper in the bowl. Let sit for 10 minutes. 5. Heat a frying pan on medium heat and add some oil/ghee to cover the bottom of the pan. Shape the mix into patties (they will be a bit wet), and fry evenly on each side until golden/dark brown. Make sure you let the patties cook enough before turning it otherwise they will fall apart. Submitted by Anonymous on Sat, 09/29/2012 - 07:05. Submitted by radha on Thu, 04/04/2013 - 12:32. Hare Krishna - Many Vaishnavas (followers of the Krishna conscious philosophy) do eat carrots, but there's always a variety of personal choices about food items. So I suppose there are people who choose not to eat carrots. Submitted by Anonymous on Fri, 04/20/2012 - 03:32. 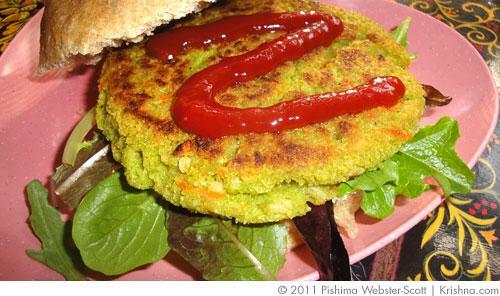 I tried this recipe and was really impressed, they were the tastiest veggie burgers i have eaten.i did make a few adjustments in that i cooked the peas untill a puree rather than blending them as i find that if the peas are not wellcooked first they give me indigestion. I also baked them in the oven on a baking tray with oil on, rather than frying them.